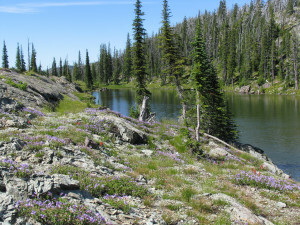 Experience all that Montana’s Glacier Country has to offer on one of our Montana camping trips! Guests need to arrive at Swan Mountain Ranch at 8:30 am on Friday for their three-day/two-night guided llama trekking adventure. Once everyone has arrived, we will give a llama orientation and trail safety speech. 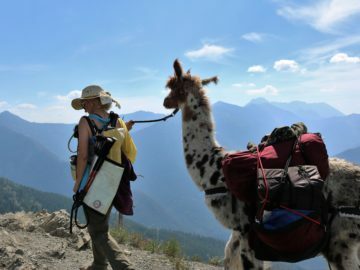 Then everyone will be piled into our llama trekkers van, and we will drive with trailered llamas in tow to the Bond trailhead nestled at the base of the Swan Mountain Range in the Flathead National Forest . Upon arrival, we will unload guests and llamas alike, pack up our lunch provisions, our overnight gear, and head out onto the trail. The llamas will tote our gear with ease as we trek along . We spend each night in a cozy campsite by one of the many alpine lakes which dot the area, or nestled in the trees or below a ridge to protect us from the wind. Montana’s long summer evenings (it is light until 10:30 p.m.) give the ambitious plenty of time to climb a nearby summit to watch the sunset, while others stroll around the lake or sit by the fire. On our last day, right after a picnic lunch, the guide will pack up the llamas, and lead the trek back down to the trail head. Once done with our hike, we’ll head back to Swan Mountain Ranch, and have you on your way by 5:00pm . Swan Mountain Llama Trekking has the ability to go to other locations for our 3-day/2-night llama camping trips, and reserves the right to change locations if necessary based on request by the Forest Service, trail conditions, fire concerns or party size. If there is something you would particularly like to do on your guided llama trek, please ask, as we have the ability to customize all of our guided llama treks to suit the needs of our guests. 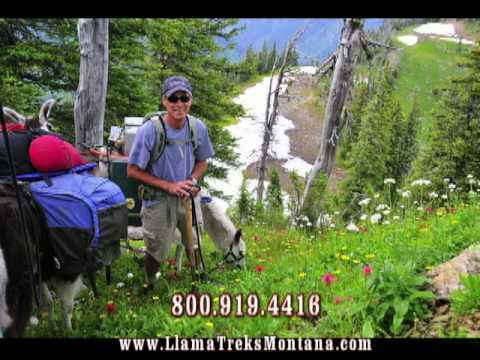 Find out why Swan Mountain Llama Trekking is your family’s best choice for Montana camping trips!